To receive college credit for riding on my university’s equestrian team, I have continued taking riding lessons throughout my internship. Cailin Caldwell photo. Awesome internships are not magical unicorns – they do exist. In Part 1 of Finding a Great Internship, I gave you some advice on how to locate your ideal internship based on your major and career aspirations. In Part 2, I’ll tell you how to get the most beneficial experience based on what the internship offers you and the work you put in. Tailor your internship to fit your needs. When I was offered the position to work at AQHA as the spring online communications and publications intern, the first thing I did (after doing a small happy dance in the school library) was march to my adviser’s office to ask him the pros and cons of accepting the position and how much it would put me behind with my classes. As we all know, college is not cheap, so the primary factor in my decision was how it would affect my scholarships. Most scholarships that are distributed over a four-year period require you to remain a full-time student. My adviser sat me down and talked me through how I could receive college credit by completing the internship and still be a full-time student. Here’s how it worked out: Keep in mind, this will vary depending on the university you attend, your college department and your individual major. At my university, you can acquire a total of 15 internship credits. All I had to do was fill out a form that described the duties of my internship and have my future supervisor sign it. Then I sent it to my adviser so he could approve that it was suitable to count toward my major. For an internship to count in my college, you need 40 hours of work experience for each credit you take, and you must take a minimum of three credits. Last summer, I completed a four-credit communications internship. To determine the amount of credits to take, I had to estimate the number of hours I would be working during my internship. When you declare the amount of credits you’d like to take, you don’t want to overestimate and sign up for five credits (200 hours) when you might only work 120 hours. After my previous internship, I had 11 internship credits remaining that I could take. This was perfect, because interning with AQHA is a full-time job – 8 a.m. to 5 p.m., Monday through Friday. I would have no problem meeting the requirements for hours worked. However, to retain full-time student status at North Dakota State University, you must take 12 credits. Fortunately, I ride on the NDSU hunt seat equestrian team. Due to the time dedicated to the team in practices, shows, meetings and volunteer activities, we receive one field experience credit. After discussing my options with my coach, we determined that I could continue riding for the team while in Texas, with the stipulation that I follow an alternate syllabus so I complete the same amount of work as the other team members. 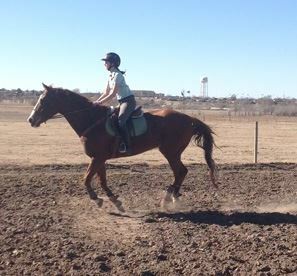 My alternate syllabus includes taking riding lessons here in Texas and writing reports that outline the horse I rode, the skills I worked on and how I’ve improved. If the team hosts a horse show or does volunteer work, I receive my own assignment such as writing a paper analyzing an informative horse-showing article. Another requirement is that I fly home in March to compete in one of our IHSA horse shows. This sounds costly, but when my parents and I calculated the cost, it was actually cheaper to do this than to take an online class in order to remain a full-time student. At the end of my internship, I will have to give a presentation about my experience to the NDSU Horsemen’s Association. This option is not for everyone, and it depends entirely on the requirements for your major, your internship and your riding team. That just happened to be how mine worked out. Because I am not required to take an internship for my major, I have a few more options for using my 15 internship credits. If I fill out a course substitution form, I can substitute six of the internship credits for six credits required for my major. This amounts to about two classes that I won’t have to take. Plus, because I am double majoring, I can also substitute these credits for classes required for my secondary major. To do this, I met with my international studies adviser to run the internship past her for her approval. In order for internship credit to apply to your major (or both majors), the type of work you do and the skills you learn must be applicable to both. My adviser explained that if my supervisor at AQHA would write me a letter explaining how working as the online communications and publications intern at AQHA applies to international studies, I could substitute credits for that major, as well. One of the wonderful things about working here at AQHA is that everyone wants to see you succeed, and they are more than happy to help. If you have the will to make something happen, they will help you find a way. Because of this, I’m able to be in two places at once – a full-time student at NDSU and an intern with AQHA in Amarillo. Plus, I compete on an IHSA equestrian team. Pretty awesome. Keep in mind that when you work an internship for college credit, you typically have responsibilities to accompany it. You may have reports to write or a final project to present about your experience. It’s important that you treat your internship like a college class and don’t neglect these duties. If you reach the end of a semester long internship that was worth 10 credits but you get a D based on your poor work, was it really worth it? You get out of it what you put in. This might seem like a heavy course load in addition to working 40 hours per week. But I’m learning valuable time-management and organization skills, not to mention beneficial career experience and earning college credit! Best of luck on your search for an internship, and have a lovely spring break! CHECK OUT THE ORIGINAL ARTICLE, PUBLISHED ON AMERICA’S HORSE DAILY!